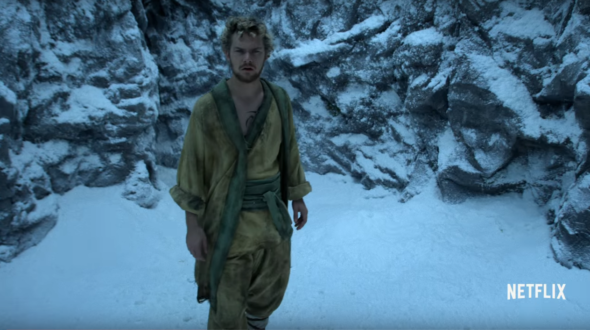 “Danny, what happened to you?” Today, Netflix released the first trailer for their upcoming original series Marvel’s Iron Fist. Based on the Marvel Comics character, the superhero drama centers on Danny Rand (Finn Jones), a billionaire martial arts expert who returns to New York City after being missing for 15 years. The cast also includes Jessica Henwick, David Wenham, Jessica Stroup, Tom Pelphrey, and Rosario Dawson. Marvel’s Iron Fist debuts on Netflix on March 17th. What do you think? Are you a fan of Netflix’s Marvel series? Will you watch Iron Fist? More about: Marvel's Iron Fist, Marvel's Iron Fist: canceled or renewed?, Netflix TV shows: canceled or renewed?